Long, long ago, here, on planet Earth, completely alien life-forms thrived and lived according to a very different yet workable paradigm. 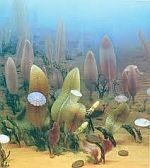 The Ediacaran fauna, predating the Cambrian explosion of approximately 550 million years ago, represent the first multicellular life. Their lifestyle was idyllic, placid, serene, to be understated. The majority of these creatures were anchored to the sea floor, fronds swaying in the currents. A day in the life consisted of passively feeding on, or absorbing, nutrients drifting by, tiny phytoplankton or detritus of dead things. It was a way of living pervading all creatures on the face of the Earth, which is to say, under the sea. We can imagine this old way--the Ediacaran world--as a thing-in-itself, a synergistic set of interrelationships, a context without fear or the need to develop strategies for survival beyond simply being and growing. But at the end of the Ediacaran Period--what marks it as the end--this script was tossed, the old play erased like a wave washing away lines in the sand. Passed an invisible threshold, a new, modern one was adopted, previously unknown roles were created, old roles revised, niches materialized out of an empty background space, drama invented. The Cambrian took the scene, and all hell broke loose. What happened? A paradigm shift from passive existence to one of predator-prey became the way of making a living, almost overnight. Why, for God's sakes? 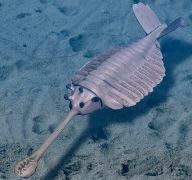 There were no bullies like anomalocaris or opabinia to worry about. No need to grow hard shells with spiny projections for protection. No reason to adapt camouflage for concealment or to grow bigger, no need to find cover, to dig holes, to burrow or seek out caves and rocky fissures to get out of harm's way or from where to launch an ambush, no provocation to develop poisons and toxicity. Peace reigned over the land under the sea. And since then, since this new way kicked in, this new life-force took over, for whatever reason, we've followed it, helplessly; or rather, it's led us, imbuing not only our physical existence, but also our minds and hearts and spirits. And not solely from within, as though individual living creatures, representatives of both flora and fauna, were somehow separate from the world around them. The new way is constantly being reinforced, the grooves deepened, by the interconnectivity and interdependence of the entire biosphere. Moreover, the whole of the Earth has collaborated to evoke this irrevocable change and sever all ties with the past. The new is not a continuation of the past separated by a hiccup, an intervening punctuation. It's not life picking up where it left off after a major extinction event. The two ways are mutually exclusive, disjoint, irreconcilable. We have a permanent disconnect, no retractions. What are the prominent characteristics of the icons of the current predatoy world? The lion, the eagle, the killer whale, the great white shark? Aggression, ferocity, ruthlessness, stealth, to be sure, but also courage, steadfastness, and cunning mark their natures. A wolf pack works together to bring down prey as do humpback whales to round up herring. They've devised strategies and teach them to their young. That's how it is now--cooperation, competition, conflict--but once upon a time it was a very different scene indeed. What happened to cause such a radical shift? All over the world? Something clicked, evolution itself altered drastically and has never returned to the former way. It learned new tricks, new ways to modify, to process, to achieve advantage and by so doing increase the complexity of nonlinear relationships exponentially and to accelerate expansively. Previously nonexistent metabolic pathways and morphogenetic fields opened up seemingly out of thin air. Evolution abandoned the old way like an adolescent casting off his braces--time to grow up and move on. Likewise, evolution has moved on; no attempt to regress has been made. But, would it constitute a true regression or just another style alongside the now one, of equal status in time and place? A continuous evolutionary line developing over millions of years was suddenly discarded as though discovered to be the wrong path, a blind alley, a mistake; oops--let's return to the drawing board. And more than simply a catepillar morphing into a butterfly, it's nothing less than a complete break with lineage, with any progenitors, as though what went before was only two-dimensional and now we have three. For sure, creatures waiting passively for food to come by still exist, but they have been subsumed under the prevailing paradigm. Under the old regime, there were no predators or prey. We see now through a different lens, a frame of reference deeply-rooted in the fiber of our being, projected out onto the world-at-large. A context that had its birth half-a-billion years ago. Immanant and transcendent, this mysterious intangible something inhabits us, having taken possession of our souls, and is indelibly etched into our DNA, shaping and directing this new approach to living. Would we exist otherwise? There must've been a time when the Great Transformation began and overrode the previous way of life, an instant when a confluence of biochemical forces and processes interacted in a unique way to produce this novel approach to living. It's as though it came from outside the biosphere, outside the realm of living things and stamped the contours of its mechanism into the very biochemistry of organic matter. We are a part of it, the whole drama, sharing this new way of life with all other creatures of Earth. How could this have come about? More importantly, will the Earth once again wipe the slate clean and start all over with a new idea on how to run things? Will the driving principle of evolution forge yet another frontier, break trail, pioneer a vista unprecedented, introduce a wholly original innovation, transform once more into a fresh new identity? Build another world with completely new tools? We are in Phase Three. The first 3 billion years was the Microbial Period--Phase One. After that we have the Ediacaran--Phase Two. Now, we're in the Cambrian Explosion Era--the Big Bang of Biology. The quintessence of each phase finds its manifestation in the method describing the way of life of the resident creatures. The organisms existing--coming into being, evolving, dying out--during each phase are but an expression of this way, embodying it thoroughly, infused as it is into every cell of their being. The Earth has its own agenda, and its modus operandi regarding how life is to proceed, what the inherent theme is to be, is a matter for Earth only, without, I might add, any regard whatsoever for what humans want or wish or think. It might be that Phase Three is only a beginning, a test, an experiment as the Ediacaran is perceived to be. What then holds for Phase Four? I don't believe we have the capacity to imagine it--I know I don't--but, most certainly, the Earth has the wherewithal to make it so. It may already be in the works. Evolution, constrained in its method by the initial conditions of Earth, pushed the reset button many moons ago, and we are as we are because of it, and could not have been any other way. There have been five major extinction events, and after each, life renewed itself, diversifying and expanding [on pre-existing phyla] to repopulate the planet. But no rebirth compares to the sudden burst of an entirely new way of living, leading up to and culminating in the Cambrian Period. Other than the emergence of life itself, this unprecedented break with the steady linear progression of evolution stands as the most significant biological event in Earth's history. Remarkable in its rapidity, around 550 million years ago, give or take, all current animal phyla -- body plans or bauplans -- came online and diversified, fanning out to fill a panorama of modernized niches, during a geologically brief 5 to 10 million year period. Considered as vectors in ecology space and therefore things-in-themselves, these niches, permeating and filling every available nook and cranny of the new [oceanic-atmospheric systems] Earth, almost seem to have precipitated (conjured?) the bizarre creatures of the Cambrian out of pure mud. But how, or by what agency, did the opportunistic flora and fauna arise? Which came first: the chicken or the egg? A cornucopia of detailed-shapes and metabolic-functions, or the environment setting the initial conditions to allow them to come into existence and sustain them in their development afterwards? Nature abandoned its old ways and fashioned a new set of tools. Evolution abruptly shifted gear, surpassing and eliminating what had gone before. Previously non-existant orders of animals with hard parts -- a breakthrough innovation called biomineralisation -- appeared from nowhere to populate the world's oceans in a geological blink of an eye. Life energy accelerated through the web of interconnections, pushing the system into a completely new phase. To this date, many conjectures have been put forth as to the essential trigger for what is considered the Big Bang of Biology. But in spite of the coincidence of a confluence of several significant factors -- necessary contingencies -- none of which alone is considered responsible, there is no comprehensive consensus or conclusive explanation for this sudden eruption of multicellular life. In all likelihood these factors are themselves effects expressing some more pervasive underlying event.